Our website is now accessible on your phones and tablets. 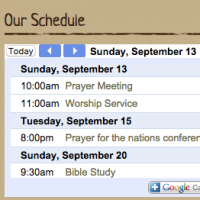 Visit www.WestchesterChapel.org on your device and check it out. On the top right of every page, just below the URL and just to the right of "A Living Picture of Real Christian Community" is a dropdown menu that will take you anywhere on the site. The one element that doesn't make the switch is our calendar, but if you're on your mobile device click here.